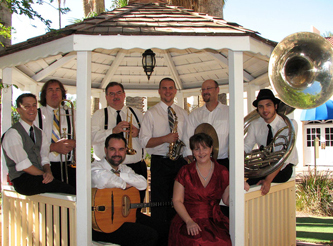 The Blue Street Jazz Band is one of the most innovative groups in traditional jazz. The band earned the reputation as “The Bad Boys of Dixieland” for their eclectic tastes in music. Featuring Dave Ruffner (trombone and harmonica), Forrest Helmick (trumpet), Sherri Colby-Bottel (vocalist), Rick Canfield (drums), Jason Wanner (piano), Nate Ketner (reeds), Matt Bottel (banjo and guitar), and Sam Rocha (bass).